Hot Sauce: If you don’t like spicy foods, then this is not for you. I have a true love for hot sauce and use it every day. 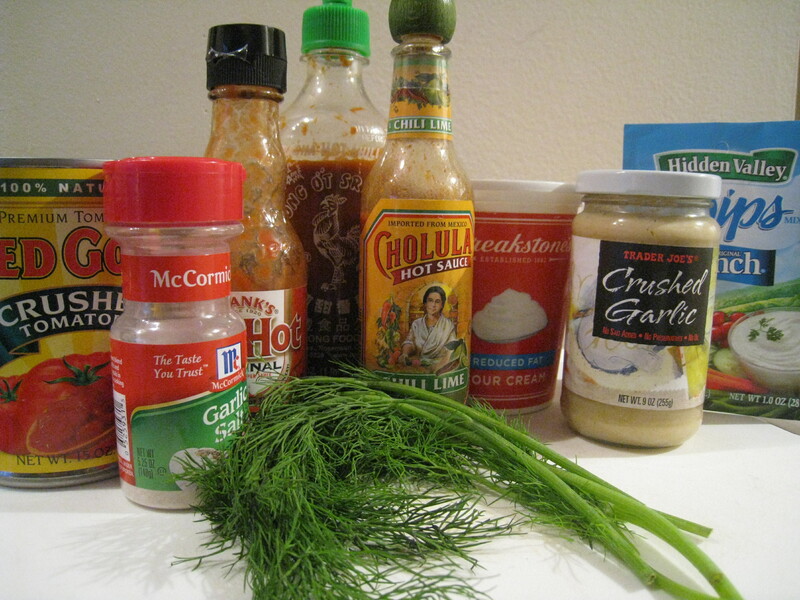 I use hot sauce in everything from eggs, meat, vegetables, potatoes, sauces, pasta, sandwiches and more. I have many different types of hot sauce, each one has a distinctly different heat. It’s such an easy way to add a burst of flavor! Reduced-Fat Sour Cream: I love using reduced fat sour cream because it makes me feel like I’m eating something creamy and sinful, when in fact, 2 tbsp only have 40 calories and 3 g of fat. Using this in moderation and adding it to various recipes can help add a new taste and texture. Try mixing it with potatoes, tomato sauce or steamed vegetables. Garlic: Who doesn’t like garlic? Garlic can be used with literally everything. I keep a jar of crushed garlic in my refridgerator so I can quickly grab a tsp when needed and not have to deal with chopping a clove of garlic. Easy and simple! Garlic Salt: I like salt, that is easy to see. Instead of using regular salt in and on foods, I like use garlic salt to add a bit of seasoning along with it. Dry Ranch Mix: Ranch dressing is notoriously bad for you, but dry ranch mix has all the flavor without the fat and calories- there are only 5 calories in a whole pack! Keep in mind there is a lot of salt, so use in moderation. You can also make a great ranch dip by adding dry ranch mix to reduced fat sour cream or Greek non-fat yogurt. You could also sprinkle it on grilled chicken for extra seasoning or mix into your favorite potato recipe to add some punch. Fresh Herbs: Fresh herbs are great to have around. It adds bursts of fresh flavor in any food you cook. Right now I’m really into the flavor of fresh dill, as you’ll see in upcoming recipes. Fresh basil is always an amazing flavor to spice up a simple pasta dish or vegetable. Canned Tomatoes: It’s great to keep a can of crushed or diced tomatoes in the cupboard for cooking. Sometimes I’ll steam vegetables and then add in some tomatoes for a bit more substance. You can also use with chicken, eggs or brown rice. I agree. A well-stocked kitchen enhances creativity and eating healthy!